When we began to make plans with our friends, Lisa and Andy, for their May trip to Walt Disney World – we knew that a visit to bluezoo was in order and we wanted to do some dining that would be new to the two of them… After all, Andy says that he comes to Disney World for the food and the friends, not for theme parks! So, we already went to the Lunch with an Animal Specialist (here and here), new for them, not for us. And since they’ve never been to Raglan Road Pub, and since our Thursday semi-routine is to have lunch there, it became lunch for four at Raglan Road Pub. Nick and I started with our standard salads. 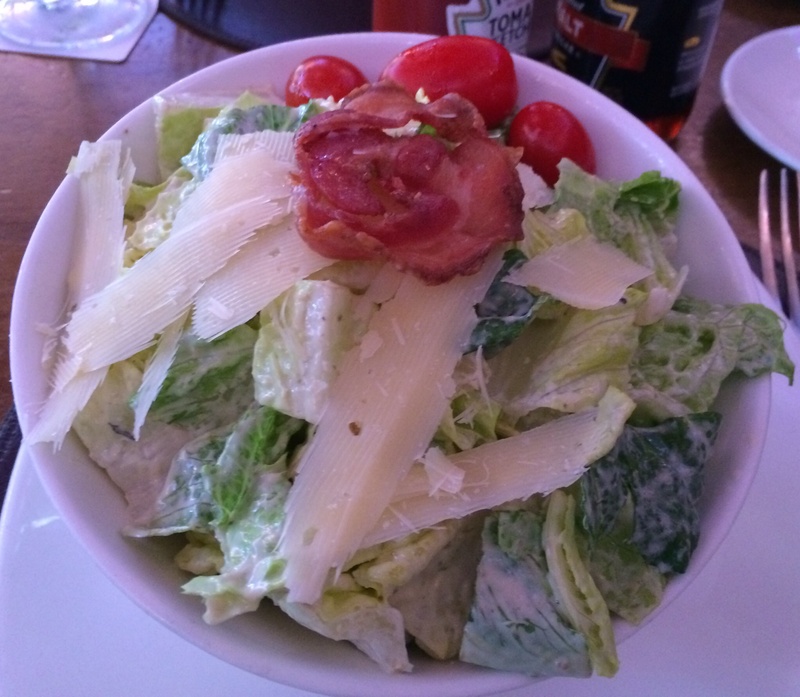 Caesar for him…which was overdressed (unusual for Raglan Road Pub). 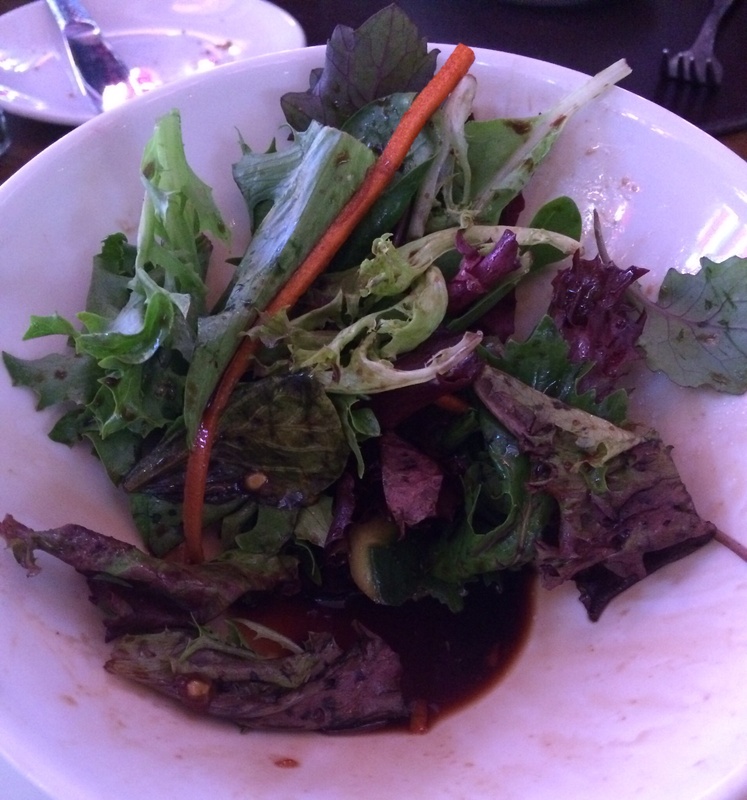 I had the Green Side Salad with Balsamic Dressing… also overdressed (sigh, this was a sign of things to come for the two of us). I’m going to talk about our lunches before I share photos of Lisa & Andy’s lunches. 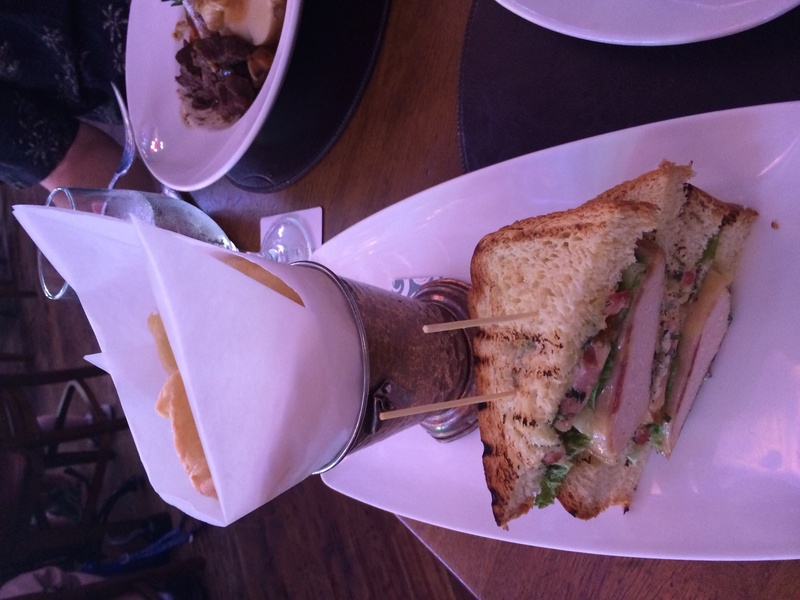 We each ordered a sandwich (we’re on a plan to try all of the sandwiches at Raglan Road Pub, we may move on to salads after that) – one brand new to us (chicken pancetta sanger) and one that I had quite a while back when Harry & Sandy and Big Al & Judy visited (lobster club sandwich). 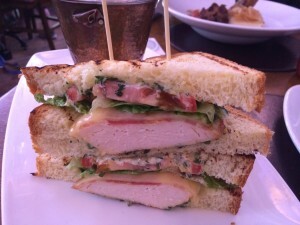 Where to start… the description “Chicken Breast with Crispy Pancetta, Dubliner Cheese, served with Lettuce, Tomato, and Herb Aioli” – well, the bread wasn’t toasted and the sandwich suffered. The wetness from the herb aioli quickly turned the bread in to a soggy mess – Ewwwww. The chicken wasn’t dried out. The pancetta wasn’t very evident flavor-wise. This wasn’t a horrible sandwich, but it definitely did not meet up to Raglan Road Pub standards – very disappointing. Also, the onion rings that Nick ordered as an accompaniment were soggy and heavily breaded – ick again. When I first had this, I wasn’t that impressed; but it was a while back and maybe it was just a bad day. Sigh. This was a bad day too, I guess. I ended up eating the sandwich fillings without the bread; it doesn’t say so on the menu, but this is served on rye bread and I have an allergy to rye. Description “Lobster and Avocado Salad, Crispy Pancetta, Watercress, and Citrus Herb Mayonnaise” – I didn’t see any avocado in the salad at all, if they aren’t using avocado because of the current shortage, then the server should let you know when you order the sandwich (more on the server later, I hesitate to even call him a server because the service was pretty bad). It just wasn’t very impressive, and after ordering it twice, I don’t think we’ll be ordering it again. And the chips – sigh again – they were not cooked through, yes, there was raw potato bits. Let’s take a look at some food that was good, okay? Andy ordered the Banger and Booz. He liked it quite a bit and cleaned his plate. When it was served, we observed that the presentation can seem a bit obscene. Lisa had the soup of the day (no photo) – potato, onion, and bacon – as always, it was very good and she enjoyed every drop. For her main, she ordered the pie of the day – Chicken Pot Pie – this was also very good, she particularly liked the puff pastry top. So, they enjoyed their lunch. 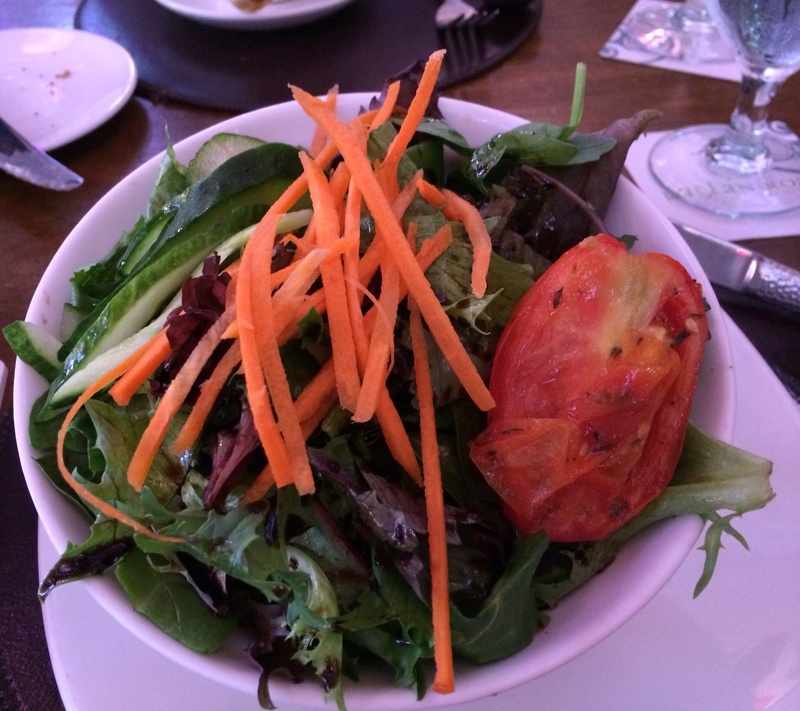 We were disappointed by our lunch, but we know that when you eat somewhere a lot, you’re likely to find a few things that you just don’t care for (although that’s no excuse for poorly prepared and presented food). 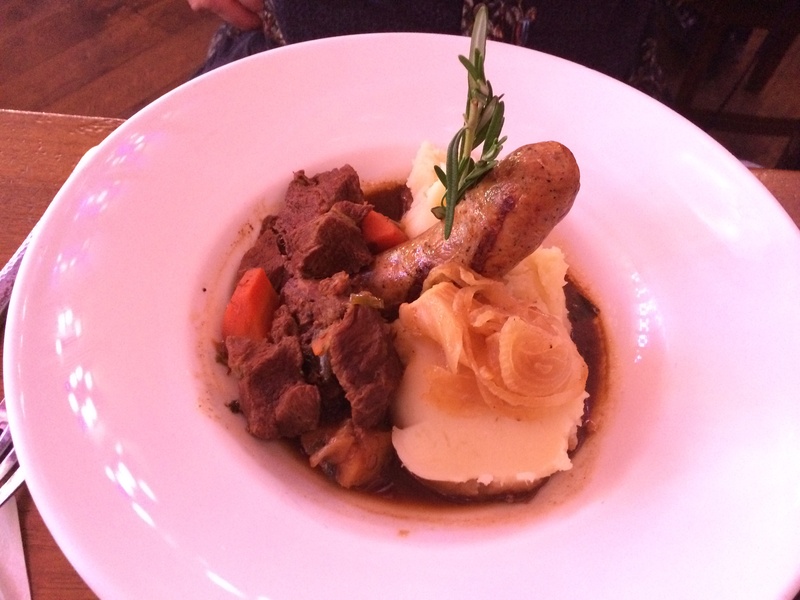 Now, a few words about our server… Service was pretty bad by Raglan Road Pub standards. He didn’t seem to have a clue about clearing the table (and why in the world are four tops not big enough for four adults to eat at? ), he tried to take away our salads before we were done, but didn’t understand that he needed to take away the bread plates when we said we were done with the bread service. 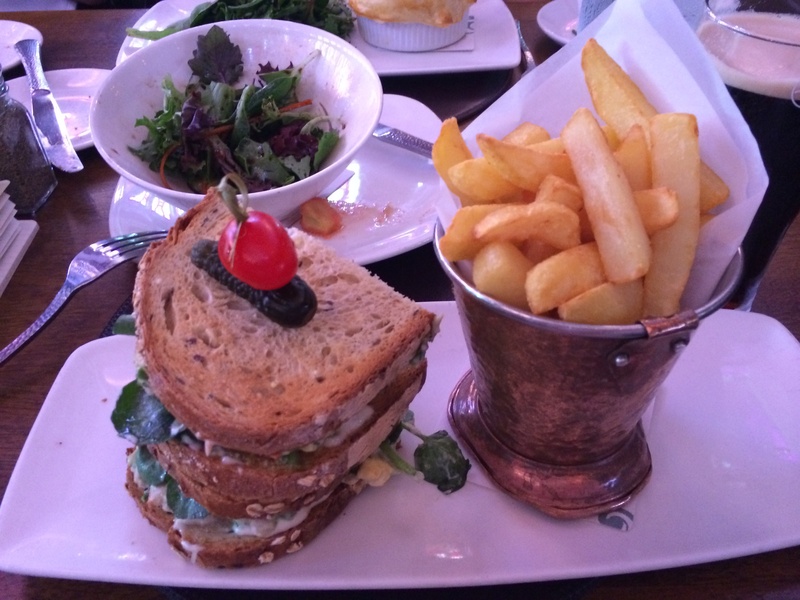 None of this will change our desire to go to Raglan Road Pub on a regular basis. And we’re pleased that Lisa and Andy enjoyed their lunches (whew! we hate to take people somewhere and for them to get bad or subpar food). We’re just a bit surprised at the food and the service on this particular visit.